The French army of Gen.
Lanrezac, on the day following the battle of Neufchateau, met with defeat, because that general had failed to carry out his instructions, which were: To occupy the city of Charleroi in full force, to entrench on both sides of the Sambre River, to destroy bridges across the river, and to secure his right flank from attack. 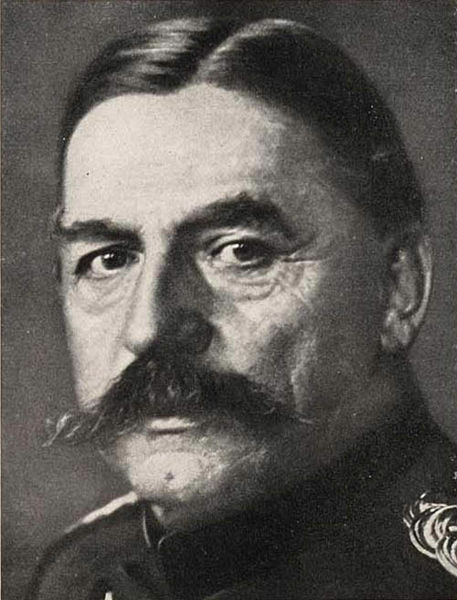 Gen. von Buelow invested Charleroi on August 22, 1914, with his full strength of 300,000 men. Crossing the bridges above and below Charleroi, the Germans poured into the city. There ensued one of the deadliest battles of the war. The thoroughfares of Charleroi at once were swept by a tempest of machine-gun fire. Great chimneys toppled over upon the combatants, burying hundreds in the debris. Hand-to-hand conflicts took place in factories, in workshops, and in the electric power station. That night Gen. Lanrezac learned of the fall of Namur. More startling still, he was informed that Gen. Hausen, with a new German army, 300,000 strong, had crossed the Meuse River at Dinant and was moving against his flank. To avoid being crushed between two enemy armies, Lanrezac gave orders for a hurried retreat southward. With heavy losses, he managed to reach Maubeuge, where he resigned his command to Gen. d'Esperey. 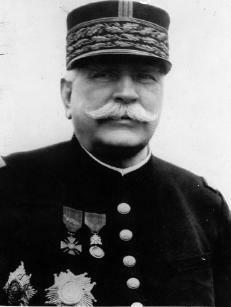 So rapid was Gen. Lanrezac's flight that he could not find time to notify the British army of his intended retreat. The losses in this battle of Charleroi were appalling on both sides. On the following day, August 24, 1914, the French evacuated Charleville, leaving behind a small artillery garrison whose machine guns were so placed as to command the three bridges that connect Charleville with Mesieres. As the German vanguard entered the two towns the bridges were suddenly blown up behind them by contact mines, and their ranks were riddled by the French machine guns. The collapse of the Meuse line on August 27, 1914 was followed by the rapid retreat of Ruf- fey's and Langle de Carey's armies, closely pressed by the three German armies of Crown Prince Frederick, Gen. von Hausen, and the Duke of Wurttemburg. A decisive action was fought on August 7 at Donchery, near the famous battlefield of Sedan. 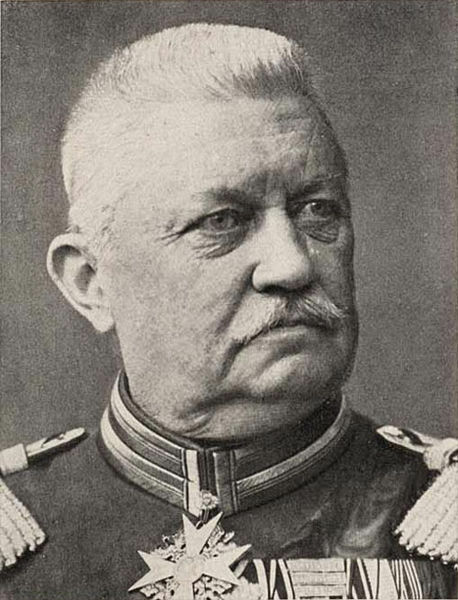 Von Hausen, moving up the left bank of the Meuse, attacked Langle in flank, menacing his line of retreat, while the Duke of Württemberg struck at his front. Against such odds Gen. Langle de Carey could not hope to prevail. Accordingly, he fell back hastily toward Rethel. The French made a brief stand on the Aisne River, where Langle de Carey had occupied the town of Rethel. After two days of hard fighting, the French were forced, on August 29, across the Aisne, and the town of Rethel was put to the torch. Crossing the Aisne, in hot pursuit of the French, the Germans captured Rheims and Chalons on. August 29, without firing a shot, and on the next day the fortressed towns of La Fere and Laon surrendered. The general retirement on the line of the Marne was continued, and the pursuit of the Germans slackened. By September 3, 1914 the French armies had finished their retreat and were awaiting the word that would send the Huns reeling back. 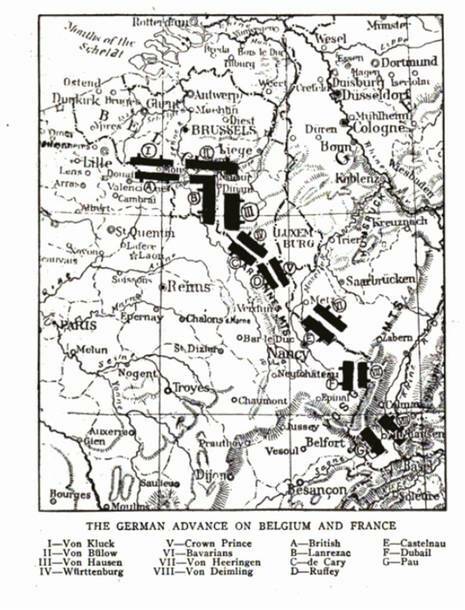 The French as well as the British had advanced into Belgium to dispute further German progress, and had penetrated to Charleroi and other points on the Sambre and Meuse just below Namur. Doubtless it would have been better military strategy for the French to await the German attack on French soil, but France would not leave Belgium unsupported against the invading German armies. The position of the belligerents in Belgium was accordingly as follows after the fall of Namur: On the extreme Allied left, the British at Mons, opposite the German First Army, and joined at Charleroi to the French Fifth Army, which was opposite the German Second Army. Southeast of the French Fifth Army, the German Third Army was making all speed southwest, and the retreat of the French Fourth Army left the German Third Army practically unopposed by forces qualified to stop it. Indeed, it is possible that the very existence of the German Third Army (under von Hausen) was unknown to the French High Command, for at this time the French Intelligence Department was far inferior to the Intelligence Department of the German Army. Farther to the southeast, the French Fourth Army was faced by the German Fourth Army, and was thus prevented from either coming to the assistance of the French Fifth Army or preventing the advance of the German Third Army. The French Fifth Army was facing the German lines in a triangular formation, with the apex pointed toward the junction of the Meuse and Sambre at Namur and with the two supporting sides along the rivers. The British were separated from the French by the Sambre, although the British lines were parallel to the French. The French Fifth Army numbered roughly about 125,000 men and the British forces could hardly have been stronger than 75,000; against them the First and Second German Armies were bringing some 350,000 men, and the Third German Army certainly amounted to no less than 150,000. With Namur, which had been counted upon for a resistance of many days, falling almost immediately upon the German onslaught, the Allies were in no position to dispute the river crossings at and just below Namur. The ground just below the junction of the rivers and facing the apex of the French position, of enormous strategic importance, thus fell in the hands of the German Second Army, which then assumed the offensive, as well it might, with so overwhelming a superiority in man-power. The fighting was of the fiercest, especially in the streets of Charleroi. Charge after charge was launched, sometimes successfully, sometimes unsuccessfully. Soon the town was practically razed to the ground, both by German fire and by French dynamite, and it no longer served as protection to the French forces. By this time, the advance guard of the Third German Army was threatening to flank the French, and the French line had to be extended to meet this danger on its unprotected right flank. 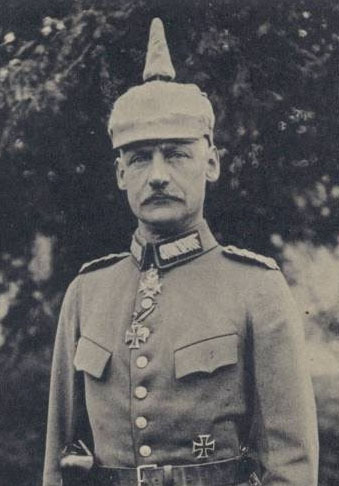 Messages from Sir John French on the west told that the British were having their hands full with the German First Army, and could not be counted upon for reinforcements. Fighting each inch of the way, the French were step by step driven out of Charleroi into the open, where the German heavy field-guns got at them, and completed their defeat. The Third German Army had crossed the Meuse at Dinant, against the French resistance, and was advancing to the west to cut off the French line of retreat to the south and east. Lanrezac had to choose between retreat and encirclement, followed by either complete annihilation or surrender; and naturally the French commander ordered a general retreat. 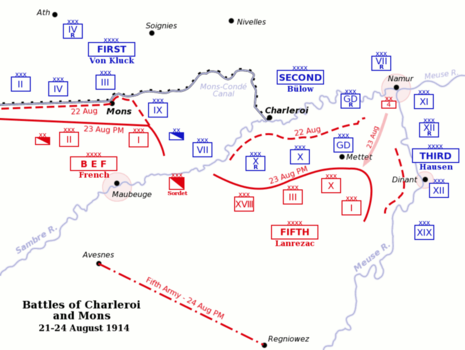 The day following the beginning of the attack on August 23, 1914, the French forces hastily beat a retreat toward Beaumont and Philippeville, succeeded in avoiding the enveloping movement of the German Third Army, and waited for news of the British at Mons before determining upon a stand near the Franco-German border. While the fighting in the streets of Charleroi was at its height, the small British army to the west was being attacked by von Kluck's First German Army. The British position was behind a canal, extending west from the Sambre, where it adjoined the French position to Conde. Throughout the afternoon of August 23, 1914, the British held on, although at various points they retired in order to straighten their line. Bit by bit the positions along the canal were abandoned. There can be only two reasons why the small British force courted disaster by sticking fast to their positions—either they were unaware of the strength of the forces opposed to them or else they counted upon support from new French or English troops upon their left, which was totally unprotected. Late on the afternoon of the twenty-third, Sir John French learned of the retreat of the French army from Charleroi, which thus left him unprotected on his right and exposed him to the danger of being surrounded on both flanks. While the German forces pursuing Lanrezac were preparing to swing behind Mons on the British right, a corps of the German First Army was rapidly getting into position to swing behind Mons on the British left.